Sewing has been minimal lately. Life’s been a little full (hello December!) but I did get the Stick-Shift baby quilt quilted and bound. It was nice to have some mindless straight-line quilting to work on when I had a minute to sit at the sewing machine. 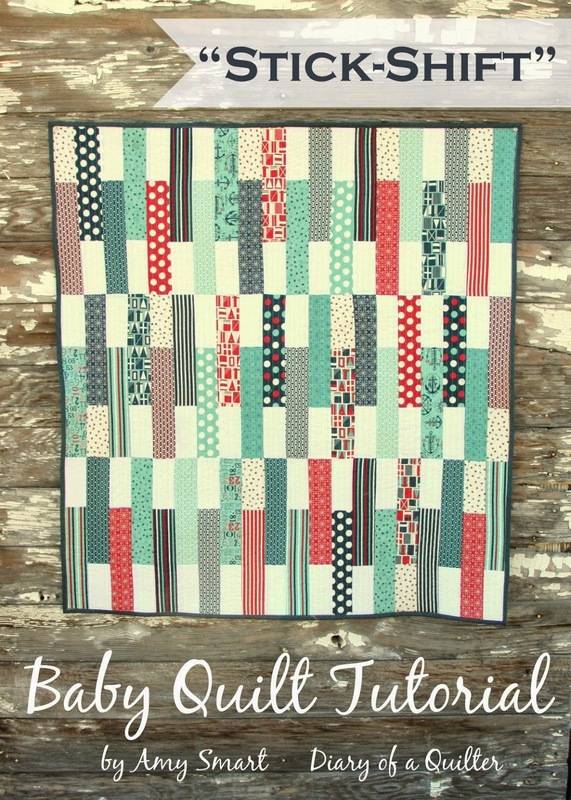 This quilt is made from Sweetwater’s new Boathouse Collection for Moda. I used a Jolly Bar (collection of pre-cuts) from the Fat Quarter Shop. Yardage should be available soon from the Fat Quarter Shop and Fabricworm as well as other fabric retailers. I’m such a sucker for nautical colors. For the backing I was determined to use something I already had on hand, and I found this home dec gingham from Ikea in my stash, waiting for just the right project to back. Check. I love the way this one turned out. I haven’t decided if I’m going to sell this one, or just hold onto it for a future baby present. Probably will end up being the latter. Here’s a little bit of the reality behind the scenes around here right now. (Avert your eyes if piles of stuff stresses you out.) We’re still in the middle of remodeling our kitchen and family room. The kitchen is making progress – the family room is in flux. As a result a lot of junk from that room is currently piled up in our dining room/sewing space. It’s not pretty, and doesn’t do much to add to the Christmas ambiance, but I’m excited that we’re making progress. It’s also motivating me to clean-out and de-junk. I’ve made two trips to drop off at the thrift store this week! Remember, there is a free tutorial for this pattern. I used the Jolly Bars, but it would also work with Jelly Roll strips. Click here for the tutorial for this quilt. If you make one, I’d love to see it! Is the binding also from the Boathouse Collection?<br />Love these colors and the pattern. It&#39;s beautiful Amy! I can&#39;t wait to see your kitchen/family room makeover — what a wonderful Christmas gift! Thank you so much for these tutorials. You sure have a way with &#39;Fast &amp; Easy&#39; Quilt Patterns. I have a few jelly rolls that I want to use for binding some quilts – now I know what to do with the left overs. Thanks so much! How far apart are those quilt lines? Really beautiful quilt! They’re about 1/2″ to 3/4″ apart. I don’t know if I could do that on a quilt bigger than a baby size, but I love the texture they give!